This Monarch Specialties computer desk will be a stunning focal point in your contemporary home office. This stylish piece features thick panels and clear lines accented in a grey finish. Crafted from sturdy manufactured wood, it's sure to support your work space for years to come. Its compact design includes all the space you need for a well-organized workspace, giving you room for a computer, notebooks, and more. Simplicity with functionality is what you will find in this retro inspired, industrial style computer desk. The chic dark taupe wood-grain laminated top, made from quality MDF material has ample space for your laptop, a lamp, some office supplies, with a suspended open shelf underneath to store books or paperwork. The sturdy black metal base adds to the airy modern look making it ideal even for compact workspaces. 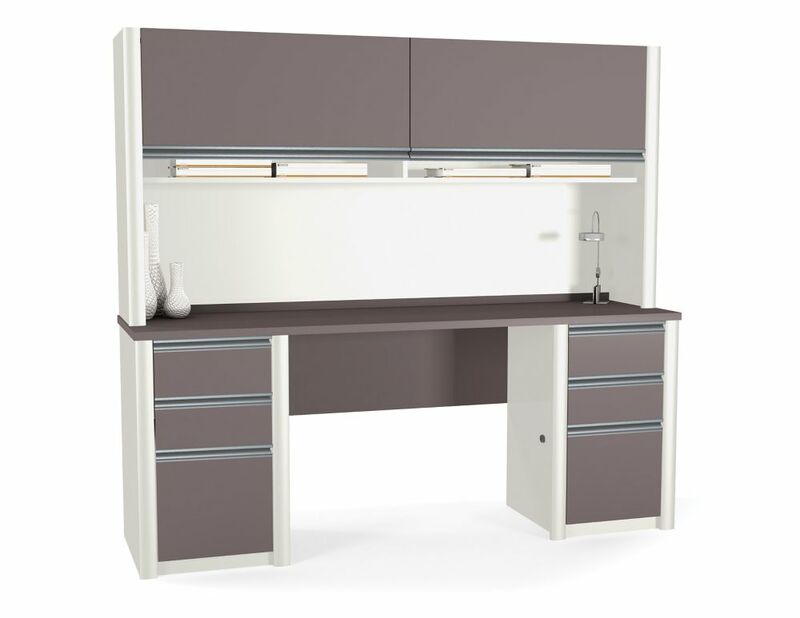 Connation 71.1-inch x 65.9-inch x 23.4-inch Standard Computer Desk in Grey Designed in modern style and durability, this Bestar computer desk is a perfect addition to any contemporary office. This piece comes designed with a classic grey finish, perfect for pairing with a variety of decor. Its sturdy manufactured wood frame provides your work space with support and lasting durability. Keep your workspace tidy and compact with this desk.